For the past five years, my tradition has been to take both a spring and a fall trip to Moab, Utah and the Four Corner States. In 2007 and 2008, I would depart Los Angeles, travel to Phoenix, Arizona and then north to Moab. Having lived in Arizona earlier on, I liked to visit the detached suburb of Los Angeles that Phoenix had become. In 2009, anti-immigrant rhetoric in Arizona reached a fever pitch. In April 2010, Governor Jan Brewer signed the statute known as Arizona AB 1070 into law. Although she saw an anti-immigrant bill as her ticket to higher office, I saw it as a poke in the eye of egalitarianism. Henceforth, I avoided Phoenix and all of Arizona whenever possible. With both the Grand Canyon and Old Route 66 running through the state, avoiding Arizona completely can be challenging. After feeling repelled by Arizona politics, I needed a new way to get from Los Angeles to Moab. My new route was to be the Old Spanish Trail, now designated Interstate I-15 North and I-70 East. Although I-15 transits the northwest corner of Arizona, it does so through the Virgin River Gorge. In the gorge, there is no place to stop or spend money. 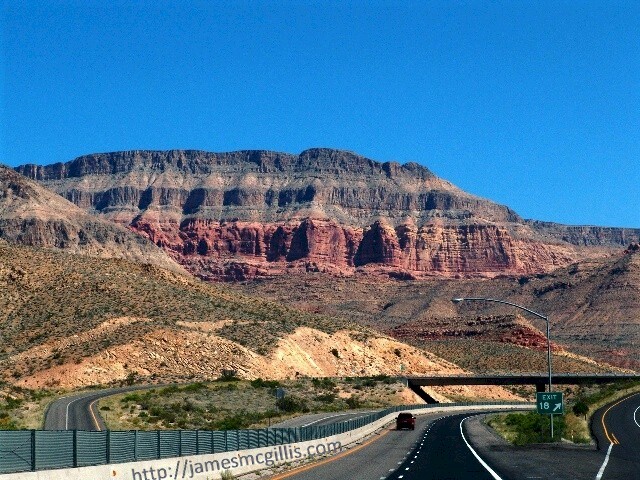 Southwest of the Virgin River Gorge, and half way from Los Angeles to Moab lies Mesquite, Nevada. Each year since 2009, I have stopped overnight in Mesquite, allowing time to absorb some local culture. On my first stop at Mesquite, I found a quaint collection of old motels and trailer courts. On West Mesquite Blvd., antique and hand-painted signs dominated the old commercial district. 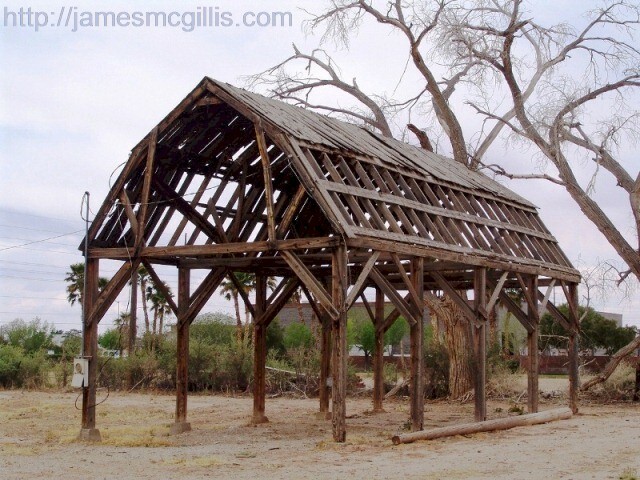 Although new development sprang up prior to the economic collapse of 2008, quaint reminders of Mesquite as a farming community and a later as a highway rest stop were evident. 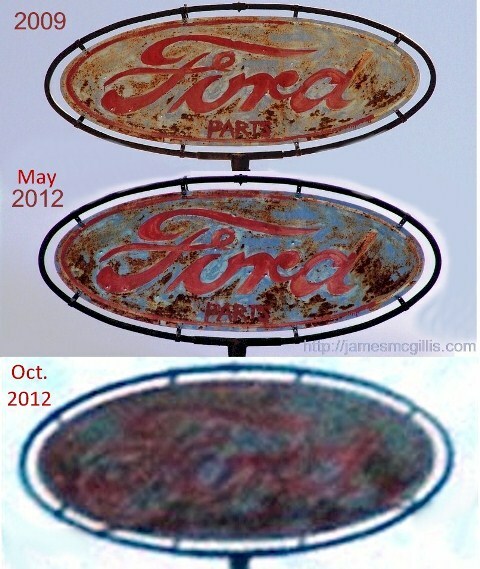 Although permanently closed, Harley’s Garage featured a hand-painted “Ford Parts” logo sign atop its tower. Words scrawled on a front window celebrated Harley’s Garage for its fifty years as a mainstay of business in Mesquite. Likewise, the contemporary Ranch Market stood closed and empty. The market’s predecessor, a humble pole barn, stood tattered by a century of weather at the back of the same lot. On my most recent visit, I caught sight of an old building on North Sandhill Blvd. Looking as if it had begun life as a house; it now stood stripped bare of its later business facade. With a new stucco exterior, it could have been a quaint restaurant or coffee stop. Instead, it featured “Keep Out” signs and other indications of its upcoming demolition. 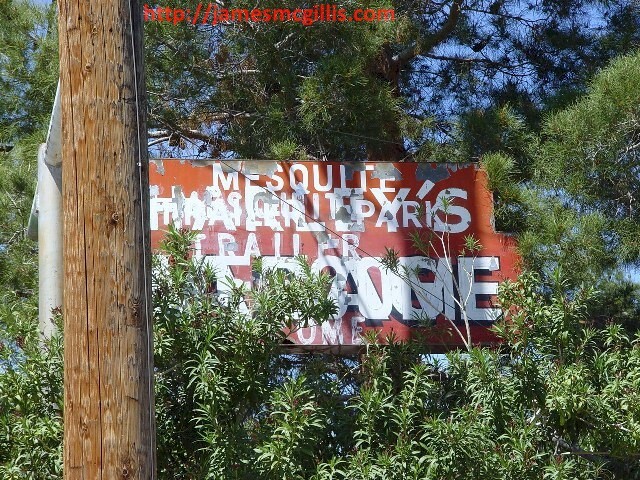 By the time of this writing, I assume that Mesquite has removed yet another clue to the town’s history. 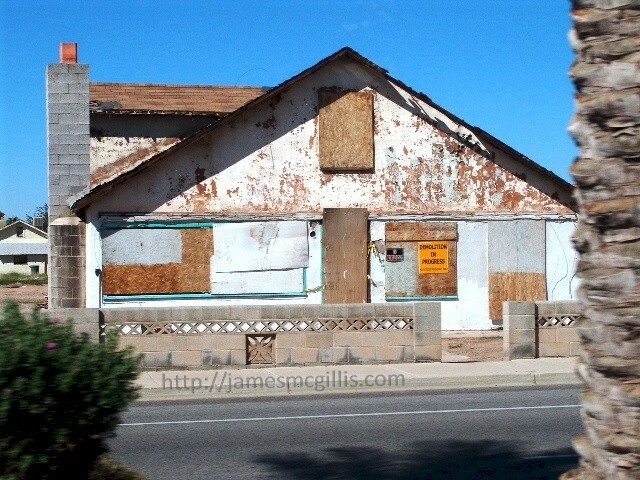 The foolishness of systematically destroying all of the historical architecture and signage in Mesquite is obvious. To see a graphic example of why, look no further than Las Vegas, ninety miles south on I-15. Gambling-induced development skyrocketed there in the 1950’s. The result was an eclectic collection of iconic and nostalgic architecture. Because of its long-term popularity, old Las Vegas earned a place in the hearts of many visitors. What else explains the popularity of the old “Welcome to Las Vegas” sign that has stood at the south end of The Strip since 1959? In recent years, a new class of casino and hotel development has prevailed In Las Vegas. With no room for expansion, developers imploded and replaced Desert Inn, The Dunes, El Rancho, The Sands and other hotel/casinos too numerous to mention. Everything in Las Vegas is bigger now, but it is a lot less fun. This recent “bigger is better” format wiped nostalgic old Las Vegas off the strip and into the dustbin of history. I remember staying in a suite at the Desert Inn in the late 1980s. Just a few yards from the Strip, my suite overlooked a tranquil, green golf course. Maybe if I were a high roller I would care that Steve Wynn personally specified the design and materials of every mattress at his Wynn and Encore hotels. Just give me a bed on the Strip with a Magic Fingers massager under the mattress, and enough quarters to make me want to unplug it and I will be happy. Out with the new and in with the old. Good luck to Mesquite, Nevada on its historical eradication campaign. For the sake of all who care, I hope the town runs out of redevelopment funds before it runs out of history.